Discussion in 'Skyrim Guides and Tutorials' started by Cordelia, Oct 10, 2017. THIS GUIDE ADDRESSES WARMTH RATINGS SEEN IN PS4. IF YOU'D LIKE TO CONTRIBUTE YOUR OWN FINDINGS FOR OTHER SYSTEMS, PLEASE DO IN THE COMMENTS, OR AS A PM TO CORDELIA. Survival Mode is now a week old, and resources are thin for players looking for a little edge to get them through the even more deadly winters of Skyrim. This guide started not as a compendium of every warmth rating in the game, but as a personal proof for myself. I love Hypothermia: Frostfall. When I heard PC players talking about it before I ever thought I could dream of playing on PC, I knew it would be the single most essential mod for my personal experience with the game, and a year or so later when I got the chance to try it out, I was not disappointed. What it brings to the game deepens my immersion, and gives me concrete reasons to treat the environment like another interactive character, rather than a space around which to push my character. One of the things that aided that experience was the dynamic warmth ratings attached to armor and clothing. As I encountered more outfits and armors in Survival Mode, I started wondering how much diversity there was between the ratings, and set about compiling that information. When it became an archive of every piece of armor I could make available in the game, I figured it was time to share that with everyone else looking for a quick reference about their preferred pieces before they spent the time and resources acquiring them. Just so we have some vocabulary to work with, I borrowed the warmth categories from Hypothermia. That gives us Standard, Full, and Limited. Full grants you the greatest amount of protection, and the list is significantly shorter than that of Standard. Skaal, Stalhrim, and Carved Nordic hang out here. Limited is probably going to get you killed anywhere but Whiterun and Falkreath. Very short list (which is probably for the best). Limited Warmth: Varied, but not in a useful way. And so, I give to you, the SkyrimForums Survival Mode Guide to Armor Warmth Ratings, starting with an alphabetized list. Expand it and use Ctrl+F or Cmd+F to find the specific armor you're looking for, or scroll down to the individual rating spoilers to narrow down your best options for survival. Tip: Use Ctrl+F (or Cmd+F if you're on Mac) and type in the armor's name to quickly find the piece you're looking for. Did you find this list useful? Lemme know in the comments below, and have fun surviving the intense new challenges ahead. *Deathbrand: Despite being Stalhrim Light armor (and all Stalhrim has the Full Protection rating), Deathbrand armor only has STANDARD Protection. This is, as far as I can tell, not an error on my end. Do you like watching people game? Why not watch me and Red play games on Twitch at TwoSirens Gaming? And if you're a fan of horror, follow me on Facebook at Death by Proxy! At a minute or two to two. My game has "full" ratings for fur armor (54 for the chest and 24 for the hands and feet- not sure about the headpiece since I just started playing yesterday and don't have one yet.) Does your game have different ratings? Edit: Different styles of fur armor have different warmth ratings. 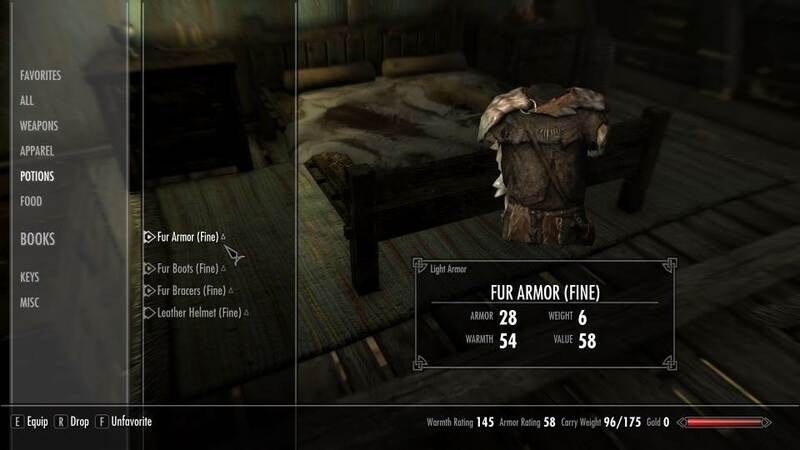 The first set of fur armor I got had a standard rating, but I picked up a different style later that had the full warmth rating. (Took me a moment to remember that.) So maybe you want to add that to your guide. Thank you for the screen shot and info. This has me a bit concerned for my game. Though I do se a mouse on your screen, so it also could be the difference between Survival Mode for PC and Survival Mode for PS4. Do you have Skyrim SE on PS4 with Survival Mode to compare? Oh, I hadn't considered that. Unfortunately, I only have it for PC. I wonder if the discrepancy is deliberate. Insofar as it may be a limitation imposed by Sony. There are MILLIONS of them. That part wouldn't surprise me, but it would continue to disappoint me. Pardon my ignorance, and veering a bit off topic, (I'm unfamiliar with the differences between console and PC skyrim), but why does Sony impose seemingly arbirtrary limitations like a difference in armor warmth (if it turns out that's the case)? That seems like something that shouldn't matter to them. Although I'm also playing on PC, I'll note that I found both "full" and "standard" warmth Fur Armor pieces in the Embershard Mine right near Riverwood at the very beginning of the game -- different bandits had different stuff on, some were full some were standard. Obviously that doesn't answer the PS4 question but it's at least an easy place (Embershard Mine) where one could go and investigate. My boyfriend is getting me an Xbox one for Christmas just so I can get Skyrim on it pretty much but is Survival Mode worth it? That's my question. And exactly how much harder does it make the game? It's more of a challenge mode than a new level of difficulty, so I can't say it's any harder than Legendary. If you don't stay on top of your needs, you'll suffer penalties including reduced health, magicka, and stamina, and reduced regeneration. There is NO health regen. If you go too long without fulfilling a need, (I tested hunger and sleep) then the screen is affected -- everything turns red for severe hunger, and blurry for lack of sleep -- and that makes it significantly harder to play. You can freeze to death, but you can't starve to death -- that said, if you leave your needs unattended long enough, then not eating or sleeping means enemies and the cold WILL kill you faster. I have a full review up right here if you want to click this sentence to be redirected to the review post. Ultimately, it makes the game significantly more challenging, and it was not a challenge that enhanced my personal play experience, because I prefer more RP and immersion-related mods and additions. This does NOT facilitate or encourage RP or immersion, but is, instead, a new challenge mode to make Skyrim into a different game of survival.